THE PAST YEAR MAY BE BEST DESCRIBED AS FULL OF CHALLENGES. MOURNING HIS MAJESTY THE LATE KING BHUMIBOL ADULYADEJ WENT ON AS THE NATION PREPARED TO BID A FINAL FAREWELL DURING THE ROYAL CREMATION CEREMONY HELD IN OCTOBER, 2017. The rapid growth of digital media and consumers has become an unprecedented test for the media industry. This “digital disruption’’ has inevitably had an impact on a wide number of business operators, the Bangkok Post Group included. The Group has braced itself for the challenge. The management and staff are geared up to move forward based on a five-pillar strategy. These five pillars will be implemented to drive continued growth in 2018. The Group’s management is confident that execution of this strategy will help maintain our status as a leader in Thailand’s media industry and a source of news and information that people can always trust. As the company’s flagship, the Bangkok Post passed through last year’s economic difficulties while maintaining its position as the preferred choice for readers both inside and outside the country. The Bangkok Post stands proudly as the leading English language daily newspaper in Thailand and one of the most trustworthy sources of news and information in the region. As a brand, it remains highly trusted by marketing professionals and advertisers thanks to a large, diverse readership base in both print and digital formats. Under the motto “the reliable business newspaper,’’ Post Today continues its policy of presenting quality news and practical information to its readers. A recent survey found that readers welcome articles and columns in the newspaper as they are presented —in a readable and conciseformat. The same is true for Post Today online which has become increasingly popular with as many as 7.9 million people visiting the website per month, a number which continues to grow steadily. Apart from daily news, Post Today also offers a variety of columns including those on lifestyle and personal finance. Its new offshoots, the online media NewsClearand 40+, have also received a warm welcome from netizens. M2F remains at the top of the freesheet newspaper market, with the largest print run and circulation network in the country. The editorial content is designed to correspond to the lifestyles of its readers, earning it regular and loyal followers who look for the newspaper each morning from Monday to Friday. Thanks to its sharp focus, M2F has attracted a large number of advertisers who have as their targets first-time employees, office workers and consumers in general. The Group’s mission of rebranding the education-related magazine Student Weekly into S Weekly, with livelier content and format aimed at drawing in teenaged readers, was accomplished with flying colours. Readers can not only learn English from the magazine’s content and exercises, but also enjoy its coverage of celebrities and other engaging features. The rebranding has created a buzz among readers which in turn has generateda renewed interest among advertisers. The growth by leaps and bounds of digital media both in terms of content, new brands and advertising revenue is among the most-watched trends in the media industry. The Bangkok Post Group is keenly aware of this trend and has put digital media development at the forefront of its agenda. The Group has, over the years, modified its business direction and strategies to ensure that it can meet the growing demands of online consumers. The company’s digital media unit has been restructured to make sure it can respond to our readers’ and customers’ ever-changing expectations. Expert consultants specialisingin digital media both at the local and international level were brought in, along with modern technologies and tools for bettersolutions. The changes started to bear fruit in late 2017 and continued expansion is expected for 2018. Magazine products showed varied performance in 2017. Fashion titles Elle and Cleo and business magazine Forbes Thailand retained their strong positions in the eyes of readers and advertisers. The men’s magazine Elle Men and lifestyle title Elle Decoration are going through a rebranding process to adjust their content and publication schedules to attain maximum efficiency. In the education segment, Science Illustrated remains popular with the largest number of subscribers among all of the Group’s magazines. A focus on promotional campaigns and sales events has sustained the business, with readers responding well to the initiatives. The business unit also went to great lengths in selecting titles that are of high quality and meet market demands. Among the most popular titles in 2017 were the Thai translations of Management Matters and Capital in the Twenty-first Century, with sales through the online channel helping to boost revenue. For 2018, the unit will seek to increase the number of outlets through partnerships with major bookstores as well as book fairs outside Bangkok. The unit generated substantial income thanks to its ability to produce supplements that fulfilled diverse customer demands. To commemorate the historic event of the royal cremation ceremony of His Majesty the late King BhumibolAdulyadejin October 2017, the company published a bilingual book entitled A Final Farewell, a special publication which received a positive response from readers. High-profile events —be they business, lifestyle or sports related —have become a hallmark of the Bangkok Post Group and serveto enhance its brand value, awareness and revenue. 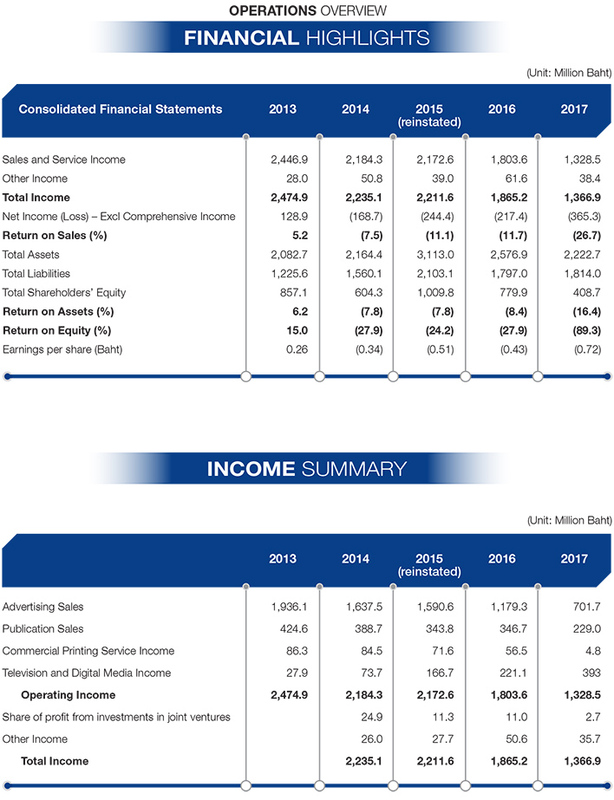 This line of business has become much more prominent in the company’s revenue profile over the past several years, following a continued decline in print advertising. The Bangkok Post Group has established itself as a leader in four types of events: business forums, sporting activities, entertainment and those with lifestyle themes. It is with great pride that we report every event held in 2017 was a rousing success and garnered enthusiastic responses from participants and advertisers alike. For 2018, the Group will build upon the past year’s success by bringing to the market seminars, forums, concerts, tournaments and festivals aimed at bolstering the brand’s premium position. The Bangkok Post Group has been well aware of the decline in the print industry and changes in the media business as a whole,and has prepared its business strategies and action plans accordingly. For 2018, the company will focus on developing digital products and organisingmore large-scale events. These two streams of business will reinforce the “Bangkok Post’’ brand while serving as effective vehicles for the company to achieve improved financial results.